Carnosaurs. The very name evokes danger  Greek for "meat-eating lizards." These theropod dinosaurs must have terrorized their dinosaurian prey during their peak in the Jurassic period. Carnosaurs are characterized by several features, mostly modifications of the pelvis and hind legs (possibly adaptations evolved along with their increased size). For example, the carnosaurian femur ("thigh bone") is usually larger than the tibia ("shin bone"). Also characteristic of the Carnosauria are large orbits (eye openings in the skull) and a generally long, narrow skull. Many carnosaurs have fairly good-sized forelimbs, unlike the Tyrannosauridae. The tyrannosaurs were until just recently classified within the Carnosauria, but cladistic analyses have shown that the traditional grouping of all of the large dinosaurs together in the Carnosauria is probably artificial, and the tyrannosaur lineage actually is a member of the clade Coelurosauria. It seems now that large body size evolved several times throughout the history of the Theropoda. Allosaurus. Photo courtesy of Don Lofgren, Raymond M. Alf Museum. Allosaurus fragilis (left) is the archetypal carnosaur, and probably the second most fashionable theropod dinosaur next to T. rex (Velociraptor also seems to be en vogue lately). Allosaurs (there were several types including Allosaurus; together forming the group Allosauridae) had large, narrow jaws, fairly long and well-muscled forelimbs with huge claws, and large legs ending in heavy, clawed feet. The UCMP has the cast of a mostly complete specimen that was formerly mounted at the California Academy of Science. 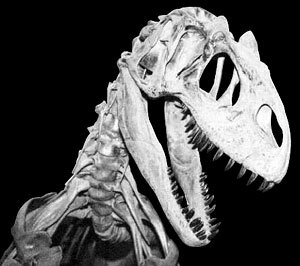 The Allosauridae existed mostly in the Jurassic period (except in Africa, where they seem to have dominated for most of the Mesozoic era); T.rex and Allosaurus never fought over food. Allosaurs were probably fierce hunters, able to grab prey with their clawed arms and rip it to shreds with their great jaws. It is possible that the taloned hind limbs were used to dispatch large prey as well, but all of this is merely conjecture. We don't know for sure how allosaurs or really any dinosaurs (except birds) behaved, but it's fun to imagine, isn't it? Megalosaurus bucklandii was the first dinosaur described (in 1824), but it was not realized that it was anything but a giant carnivorous lizard until Sir Richard Owen proposed the term Dinosauria in 1842 to differentiate the dinosaurs from other diapsids. Unfortunately, there is now some doubt whether there truly was such a thing as Megalosaurus; the few fragmentary remains once thought to be Megalosaurus may actually be bits of different carnosaurs. For now, many miscellaneous carnosaurs are grouped together as "megalosaurs." Spinosaurus aegypticus was known formerly by a single Egyptian specimen (mostly bits and pieces) that was destroyed in WWII. It was once the only unique African theropod known; now ongoing field research by paleontologist Paul Sereno of the University of Chicago is showing a great diversity of unique African theropods, many of which show relationships with North American specimens; such as Afrovenator abakensis, which is similar to Allosaurus. These new dinosaurs are providing glimpses into what evolutionary events were occuring in Africa (compared to North America) while the continents were splitting apart. Thus, theropods show us something about how evolution works!